We spend 80% of our time in close spaces: home, work, transport. 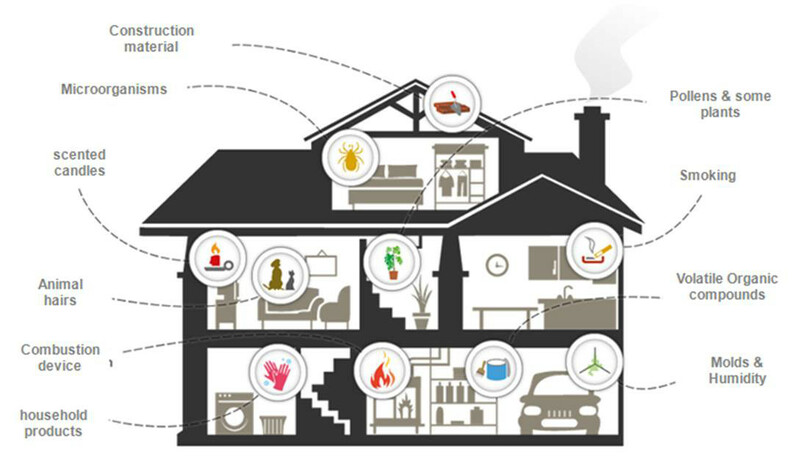 In such spaces, the air can be 5 to 10 times more hazardous than outdoor air: the increase of air tightness of buildings generates an issue with air renewal. Bacteria, spores, pollen, fungi, airborne microorganisms, cigarette smoke, an other harmful particulates in the air are a growing problem. They are produced by human activity such as building material, cleaning products, furniture, etc. According to the World Health Organization, 40% of all buildings pose a serious health hazard due to indoor air pollution. The golden rule: aerate your home every day. Watch the indications on labels: in many countries, construction materials and furniture have a label indicating the level of emission: from A+ (very low) to C (high). In addition , products limiting their impacts will often display ecolabels (NF Environment, European Ecolabel) . An ADEME guide offers an overview of our air quality . It details the families of pollution sources and their impacts on our health ; it provides practical solutions and advice.